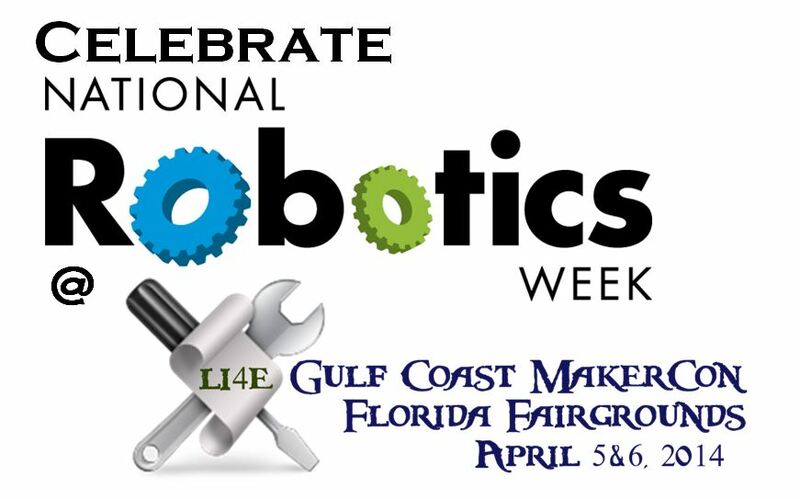 Kick off National Robotics Week at Gulf Coast MakerCon Robotics Showcase! We’ll be helping kick off National Robotics Week with a Gulf Coast Makercon Robotics Showcase, front and center at our 3rd Annual Celebration of DIY Inventive Spirit. We’ll have K-12 FIRST robotics teams from around Tampa Bay . With support from a comprehensive network of Fortune 500 corporations, educational and professional institutions, foundations, and individuals, FIRST provides more than $18 million in college scholarships for participating students. Programs include FIRST® Robotics Competition (FRC® ) for students in Grades 9-12;FIRST® Tech Challenge (FTC® ) for Grades 7-12; FIRST® LEGO®League (FLL® ) for Grades 4-8; and Junior FIRST® LEGO®League (Jr.FLL®) for Grades K-3 and you’ll be able to see most, if not all, of these programs strutting their awesome robotic stuff at GCMC. We’ll also be featuring 15 lb. and under fighting robots in National Robotics League demo competitions, a combat robot program with a focus on manufacturing related careers. Organized by the University of South Florida Robotics Interest Group, we’ll have high school student competitions all day Saturday, April 5, and NRL exhibition robots throughout the weekend. We’ll also have a variety of hobby and personal robotics projects and displays, and related mechatronics exhibits., and we’ve got room for more! If you’re interested in joining us with your robotics projects, complete our Maker Application and join in our National Robotics Week Celebration! This entry was posted in Gulf Coast Makers Festival, MakerCon, Robotics and tagged FIRST, Gulf Coast Makers Festival, makers festival, National Robotics League, National Robotics Week. Bookmark the permalink.